For the bungee jumper, see David Kirke (bungee jumper). 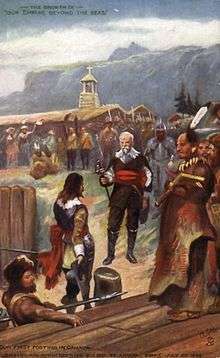 Champlain surrenders Québec to admiral Kirke, on July 20, 1629. Sir David Kirke (c. 1597 – 1654) (a.k.a. David Ker) was an adventurer, colonizer and governor for the king of England. He is best known for his successful capture of New France in 1629 during the Thirty Years' War, and his subsequent Governorship of lands in Newfoundland. A favourite of Charles I of England, the fall of the crown during the English Civil War led to Kirke's downfall. It is believed he died in prison. David Kirke was the son of Gervase (Jarvis) Kirke, a wealthy London-based merchant, and Elizabeth Goudon, a French Huguenot woman. He was raised in Dieppe, in Normandy. :42 David was the eldest of five sons, followed by Lewis, Thomas, John and James. 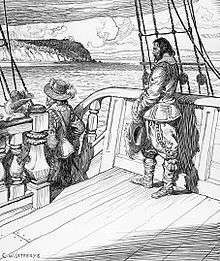 Champlain leaves Quebec as a prisoner aboard Kirke's ship, after a bloodless siege in 1629. Image by Charles William Jefferys, 1942. A second English invasion fleet, of six ships and three pinnaces, left Gravesend in March 1629 with Jacques Michel, a deserter from Champlain, to act as pilot on the St. Lawrence River. Champlain sent a party from Quebec, whose residents were on the point of starvation, to meet an expected relief fleet under Émery de Caën. Unknown to Champlain, de Caën was also bringing word that peace had been declared in April in Europe by the Treaty of Susa. Although Champlain's party met de Caën in the Gulf, they were captured by the English on their way upriver to Quebec. Kirke, now aware of the desperate conditions at Quebec, sent his brothers Lewis and Thomas to demand surrender. Having no alternative, Champlain surrendered on 19 July 1629. As a consolation, Kirke was knighted in 1633. Kirke is believed to have visited Ferryland, as he published a report on the island of Newfoundland in 1635. Kirke was impressed by the island's fisheries, and in 1637 he asked King Charles for a land grant. In November 1637 Kirke and his partners were granted a royal charter for co-proprietorship of the entire island. A portion of Newfoundland, the Avalon Peninsula, had already been granted to George Calvert, but he was accused of abandoning his colony (before his death in 1632), and the lands were transferred to Kirke. The charter of this grant had stipulations designed to reduce conflict with migratory fishermen; there was to be no settlement within six miles of the shore, fishing rooms were not to be occupied before the arrival of the summer fishing crews, and a five per cent tax was to be collected on all fish products taken by foreigners. Kirke was installed as the Proprietary Governor, and arrived in 1638 with 100 colonists. The original governorship of the Avalon Peninsula had passed to Baltimore's son, Cecilius (Cecil) Calvert, who had installed William Hill as governor. Kirke seized the governor's mansion, then occupied by Hill. In January 1638, the king also granted Kirke a coat of arms, “For the greater honour and splendour of that Countrey and the people therein inhabiting … to be used in all such cases as Armes are wont to be by other nations and Countries.” In 1639, Kirke renamed the colony the Pool Plantation. Over the next several years, Kirke erected forts at Ferryland, St. John’s, and Bay de Verde. He collected tolls from all fishing vessels. Kirke was granted the rights to "the sole trade of the Newfoundland, the Fishing excepted." The latter clause resulted in considerable trouble. At the time the Grand Banks of Newfoundland were being fished by many European nations, and Kirke's 5% tax gave the advantage to the English. A number of West Country merchants thrived on the fish trade. Represented in London by Kirke, Barkeley and Company (with several of his brothers at the helm), Kirke used his land rights to support the fish trade, in conflict with the charter terms. By 1638 strong ties between Ferryland and Dartmouth, Devon had already been set up. Kirke brought the entire trade network south of St. John's under a growing family commercial empire. These actions aroused strong animosity from the West Country merchants. The planters and migratory fishermen agreed that Kirke was reserving the best fishing rooms for himself and his friends. In addition, he was accused of opening taverns, which were disruptive to the settlers' work. But before these charges could be investigated, in 1642 the English Civil War broke out between the king and parliament. The war ended in 1651, and the Kirkes, as royalists, were on the losing side. Although the merchants' complaints were put aside during the war, they were revived at the end of the war. The Kirkes were no longer protected by the crown. In 1651 a team of six commissioners, led by Maryland merchant John Treworgie, were sent to Ferryland to seize Kirke and bring him to England to stand trial. His lands were acquired by the Commonwealth. Found not guilty, Kirke re-purchased the title to his lands in 1653. His wife, Lady Sara Kirke, returned to Newfoundland to oversee his business and reclaim his property. But Cecil Calvert brought new charges against Kirke over the title of the lands around Ferryland. Kirke is thought to have died in the original Southwark jail, The Clink, as early as January 1654, while awaiting trial. Treworgie was granted governorship of Newfoundland in 1653; he was already in Ferryland (apparently never having left after 1651). The next year he and two other commissioners were arrested by James Kirke for holding position of lands rightfully owned by the Kirkes, and an unpaid debt of £1,100. Treworgie maintained that Kirke's possessions had been returned to his wife, but was found guilty in a first trial. A personal plea to Oliver Cromwell resulted in a second trial. The outcome is lost, but historians believe that Treworgie was found not guilty as he continued to serve as governor until 1660. In 1660, Treworgie returned to England to ask for another term as governor and the six year's salary he claimed he was owed. He never returned to Newfoundland. The Restoration in 1660 re-opened the debate between the Kirkes and the Calverts over the ownership of the Avalon Peninsula. This time Cecil Calvert was successful in gaining the royal patent on Avalon, but he never took up residence. David Kirke's brother, now Sir Lewis Kirke, demanded compensation for improvements made at Ferryland by the Kirkes. Lady Kirke petitioned Charles II to make Lewis' nephew George Kirke the governor of Newfoundland, an arrangement suggested by the Newfoundlanders, but the king did not appoint any resident governor. Lady Kirke and her children were still in Ferryland in 1673 when a Dutch fleet sacked and burned the settlement during the Third Anglo-Dutch War. A decade later, in 1683, Sir John Kirke, whose daughter had married Pierre-Esprit Radisson and who was himself a member of Prince Rupert’s Hudson’s Bay Company, asked the king for compensation for the losses incurred in the conquest of Canada in 1629. He claimed that the French had never paid the Kirkes for the return of the lands. The last known reference to his nephew George Kirke dates from 1680, when he was proposed as a collector of the toll levied on all boats fishing in Newfoundland waters. Lady Sara Kirke managed the Pool Plantation at Ferryland throughout this period. Between 1651 and her retirement in 1679, Sara and her sons developed a number of plantations at Ferryland and Renews. During raids by Dutch ships from New Amsterdam in 1665 and 1672 in the Anglo-Dutch Wars, they lost property. As late as 1696, three of Sir David Kirke's sons, George, David Jr. and Phillip, remained substantial planters on the Southern Shore of Newfoundland. The Coat of Arms granted to Kirke was lost during the civil war. During the aftermath of World War I, the Imperial War Graves Commission in Europe asked what arms should mark the graves of soldiers from Newfoundland. During the subsequent investigations, the Arms were rediscovered. In 1928 they were adopted as the official Coat of Arms of Newfoundland and Labrador. ↑ Marquis, Thomas Guthrie. The Jesuit Missions: A Chronicle of the Cross in the Wilderness (Toronto: University of Toronto, 1964) 18. ↑ Kirke, Henry (1908). The First English Conquest of Canada with some account of the earliest settlements in Nova Scotia and Newfoundland (Second ed.). London: Sampson Low, Marston & Co Ltd. Retrieved 2014-06-12.